The global doppler ultrasound systems market was valued at approximately US$ 1.3 Bn in 2017. It is projected to expand at a compound annual growth rate (CAGR) of more than 7.5% from 2018 to 2026, according to a new report published by Transparency Market Research (TMR) titled ‘Doppler Ultrasound Systems Market – Global Industry Analysis, Size, Share, Growth, Trends, and Forecast, 2018–2026’. Expansion of the health care industry, increase in government initiatives, rise in health care expenditure and product approvals, and increase in patient population are projected to augment the global market from 2018 to 2026. 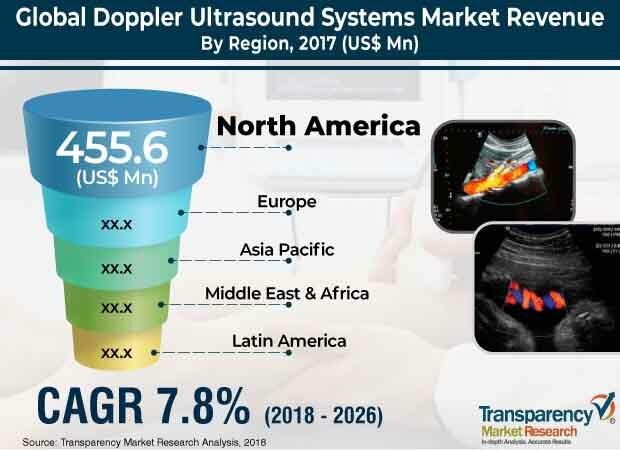 North America and Europe are likely to account for a dominant share of the global Doppler ultrasound systems market, owing to the presence of key players in these developed regions as well as high rate of adoption of technologically advanced Doppler ultrasound systems in these regions. Development of health care infrastructure and high medical expenditure by governments in emerging economies, such as China and India, are likely to boost the Doppler ultrasound systems market in Asia Pacific at a CAGR of 8.8% from 2018 to 2026. Rising incidences of various disorders such as cardiovascular diseases and respiratory and abdominal disorders is likely to propel the Doppler ultrasound systems market. According to World Health Organization (WHO) estimates, 2015, cardiovascular diseases (CVD) account for 9.4 million deaths globally each year. The number is likely to increase to 23.3 million by 2030. Hence, demand for Doppler ultrasound systems for diagnosing various CVDs is increasing due to improving image production quality. Rising number of patients suffering from pulmonary artery related disorders would also drive the demand for Doppler ultrasound systems due to increasing applications of these devices in lung imaging. The WHO has estimated that around 8.7 million people suffered from tuberculosis (TB) and around 1.4 million died due to the disease in 2015. Rise in the population suffering from TB would boost the demand for Doppler ultrasound systems majorly in low and middle income countries such as India, China, and those in Africa. Increasing rate of abnormalities in fetuses due to pregnancy at a late age is estimated to drive the demand for Doppler ultrasound systems. Doppler ultrasound devices are utilized extensively for obstetrics imaging, due to the absence of harmful radiations. According to the March of Dimes Foundation, nearly one in every 150 newborn babies suffers from chromosomal abnormalities. Hence, fetus diagnostics is essential to treat chromosomal abnormalities at an early stage of pregnancy. Increasing incidence rate of such abnormalities would increase the demand for Doppler ultrasound systems during the forecast period. Thus, rising incidences of CVDs, complications during pregnancy, and dental problems is projected to increase the adoption of Doppler ultrasound imaging, which in turn is anticipated to drive the market. An ultrasound device manufacturer is expected to pay additional Medical Device Excise Tax (MDET) of 2.3% on the sale of every ultrasound device, under the Patient Protection and Affordable Care Act (PPACA) of the U.S. Manufacturers and importers of ultrasound devices are expected to pay a certain amount on the sale of specific medical devices. According to the Joint Committee on Taxation of the U.S., the excise tax is likely to cost around US$ 29 billion over the period 2013 to 2022. Therefore, implementation of this Act would only increase expenses for ultrasound device manufacturers, as they would end up paying an additional 2.3% excise duty. This, in turn, is expected to hamper the ultrasound devices market. Countries in Asia Pacific, such as China, Japan, and India, offer significant opportunity to the Doppler ultrasound systems market. China is estimated to be a prominent market for Doppler ultrasound systems after Japan, which accounts for a notable share of the market in Asia Pacific. The region consists of developing countries that require low priced diagnostic technologies to progress and offer citizens basic medical facilities. Economies in the region are expanding significantly; however, they still have to adapt to the digitization of Doppler ultrasound technologies. The report also provides profiles of leading players operating in the global Doppler ultrasound systems market. They include Canon Inc., Koninklijke Philips N.V., Siemens Healthcare Private Limited, Analogic Corporation, FUJIFILM Holdings Corporation, Hitachi, Ltd., GENERAL ELECTRIC, SAMSUNG, Shenzhen Mindray Bio-Medical Electronics Co., Ltd., and Esaote SpA. Increase in mergers & acquisitions, strategic collaborations, and new product launches are expected to drive the global market during the forecast period. Additionally, strong product portfolio, high brand recognition, and strong geographic presence are expected to boost the market during the forecast period.